Just because the holiday season is over doesn't mean you have to give up on the joyful festivities & the holiday aromas. After Christmas I celebrated my second annual tradition of going to Bath & Body Works to restock on the Wallflower refills. 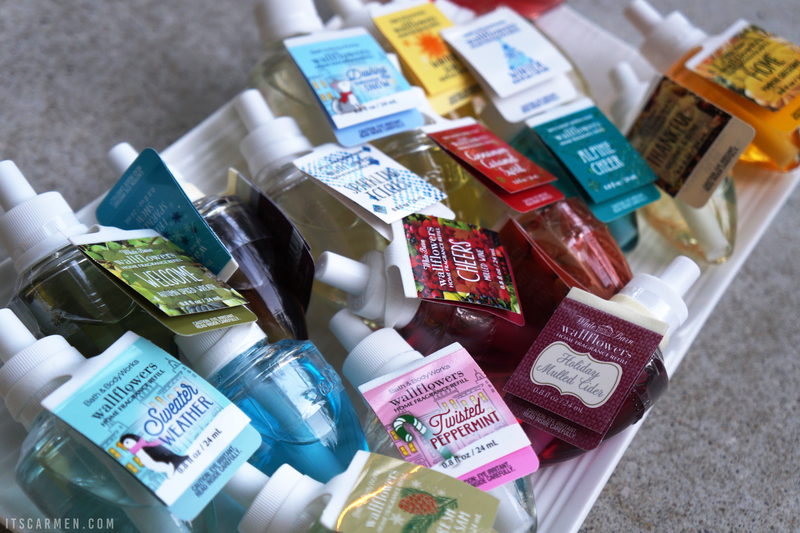 If you want to learn more about them, take a look at my Bath & Body Works Wallflower Review; it has all the information you need to determine whether a Wallflower is a good fit for you or not. I love them because they're a hassle-free way to have a constant wave of lovely scents waft through the room. I did some after Christmas shopping & splurged on these Wallflowers. I went all out & purchased 18 different ones! I even rejected a few just to cut down on the price. They were on sale for $3 a pop; their regular retail price is $6.50. Last year I bought them for $2.50 so their sale price went up. However, each Wallflower refill lasts about four weeks/one month, so this batch is sure to get me through the whole year & then some -- approximately a year & a half. Alpine Cheer - Breathe in crisp mountain balsam, cedar wood bark, & snow white cranberry. Cheers Mulled Wine - Raise a glass with red fruit & mulled apples layered over rare saffron spice. Cinnamon Caramel Swirl - Cinnamon enhances silky vanilla caramel in the fragrance of a holiday treat. Cinnamon & Clove Buds - A warmly spicy scent -- classic cinnamon, simmering clove buds, & exquisite vanilla. Dashing Through the Snow - Enjoy the crisp cool air of a sleigh ride with balsam, wintery musk, & sparkling citrus. Fresh Balsam - The invigorating fragrance of snow-dusted balsam, fir, & eucalyptus. Fresh Sparkling Snow - Icy pear, frozen melon, & frosted musk capture winter's sparkle. Harvest Cranberry Woods - The beauty of harvest in fresh cranberries, black currant, & cinnamon. Holiday Mulled Cider - Enjoy apple cider mulled with holiday spice & creamy birchwood. Home Pumpkin Cheesecake - Decadent cheesecake in notes of spiced pumpkin, cream, & a golden crust. Sparkling Icicles - Let holiday parties sparkle with the fragrance of moss, bergamot, & citrus. Sweater Weather - Cuddle up with an aromatic blend of eucalyptus, juniper berry, & fresh sage. Sweet Cinnamon Pumpkin - An inviting mixture of harvest pumpkin, sweet vanilla cream, & cinnamon stick. Thankful Chestnut & Clove - A luxurious blend of rich chestnut, aromatic cedar, & freshly ground cloves. Twisted Peppermint - Make it very merry with peppermint, vanilla & sugary musk. Welcome Autumn Spiced Wreath - Welcome Thanksgiving with balsam sprigs, cinnamon bark, & ground cloves. Winter - Pine, icy mandarin, & winter woods embody this sparkling season. Winter Sun - A blend of citrus, vetiver, & musk inspired by winter sunlight. Some of these are very clearly Thanksgiving/autumn related aromas whereas others are Christmas/winter related. Given that each Wallflower is three bucks & will last me about 30 days, that adds up to about $.10 a day. That's not a bad figure at all. My boyfriend randomly chose one & we currently have Holiday Mulled Cider keeping the bedroom smelling fresh. Within about an hour I noticed the smell emitting from the Wallflower. It's noticeable but not overwhelming for your nose. I would not purchase these at regular price that's why I stock up once a year after Christmas. To me, $6.50 for each Wallflower is simply not worth it but $3 is considerably more approachable. I have never used any of these particular fragrances before but I'm glad that I can continue the holiday spirit throughout the year. 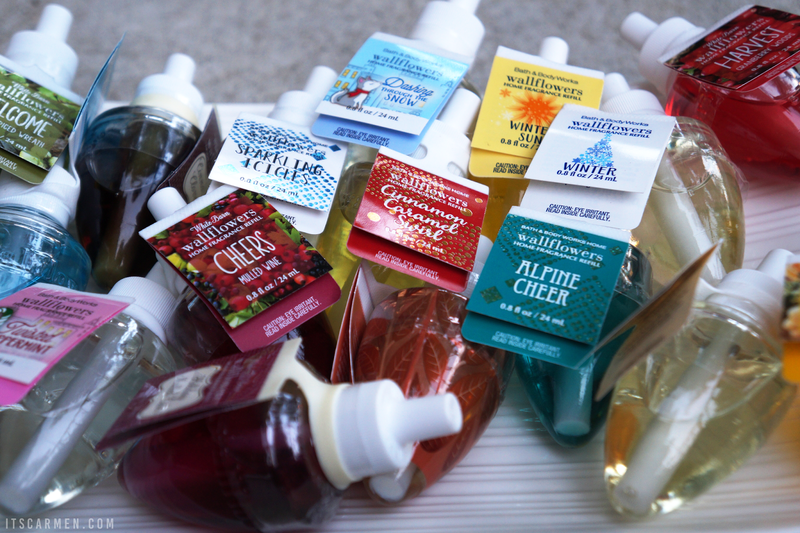 I just stocked up myself and purchased 6 of the Cranberry Woods and 6 of the Sweater Weather. I love both these scents in the winter and agree that at $3 they are much for enjoyable than the ridiculous $6 normal price. Plus they usually have a coupon online! Omg, you really stocked up. I think it's finally time I try one of these! When I saw your featured image I was like 'Yes, I need to read this!' I LOVE Wallflowers! For my small apartment we only really need one (currently Caramel Pumpkin) and it makes the whole house smell absolutely amazing! ok ok. I think I'm done ranting about my love for wallflowers. Thank you for sharing and I am uber jealous of your stockpile! I haven't tried this out yet, but I totally want to. that's such a steal. I can just imagine the scents. 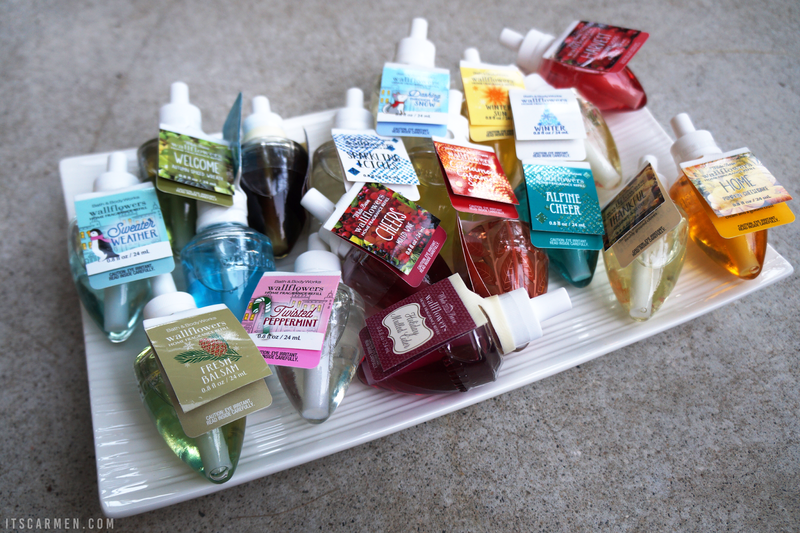 I love the Wallflowers and my favorite are their "Sleep" scents for aromatherapy! It smells so soothing! That's quite a haul, never tried the brand, but an exquisite share. Shared. 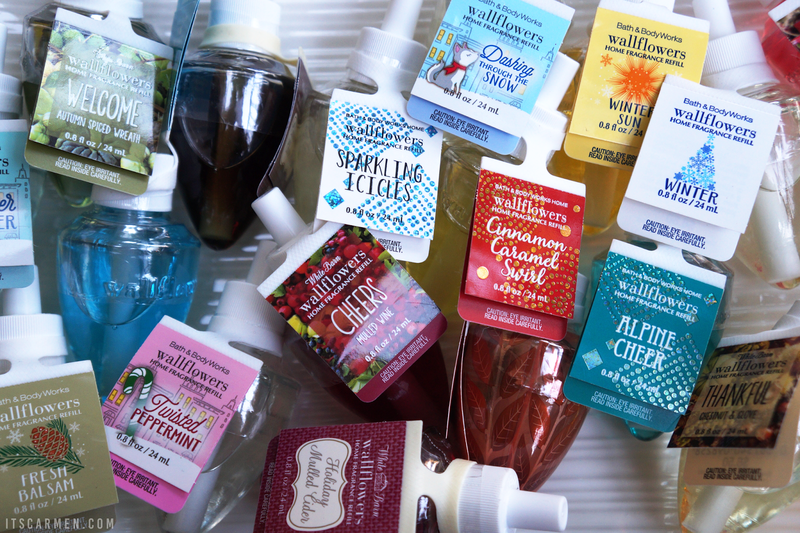 I worked at Bath and Body Works for a couple summers in college and their Wallflowers were by far one of the most popular things that people came in looking for! Looks like you had a great haul! Wow, way to rack up!! Good selections, too! These sound lovely! You were right to stock up when they were on sale! That's a great haul!! Love their wall flowers! Wow! You really went to town with these :D I love nice and festive scents and I could smell them all year round! My favorite bath and body works candle is Marshmallow Fireside! Some of these sound really yummy! I so so so wish we had a Bath and Body Works in the UK! I always see people getting the most amazing products from there and get really jealous that they don't even ship here! Genuinely starting to consider a holiday to the US just so I can stock up and bring some things home! I didn't even know that this brand existed, but they have some amazing products that I'd love to have.